The average asking price of a home for sale in Maple Grove MN is $325,000. Single family homes in Maple Grove consist of many styles although Two Story’s are more prevalent. Home buyers seeking older, more established neighborhoods, will find many choices in Maple Grove. Buyers searching for new construction homes for sale in Maple Grove are in luck. With new neighborhoods currently underway, buyers will find new homes from $390,000 to $975,000. Luxury, or more high end homes for sale in Maple grove will be found in neighborhoods like The Woods at Rush Creek, Stonegate at Rush Creek, Appaloosa Woods and The Enclave at Dunlavin Woods. Children of home buyers in Maple Grove will attend the 279 school district. Once you find a home in Maple Grove you like, don’t hesitate. The housing market moves quick in MG. On average, homes for sale in Maple Grove sell in 43 days or less. Have a home to sell in Maple Grove? Fill out our easy online appraisal form here, or call DMG at 612-282-SOLD anytime. Some of the Maple Grove neighborhoods you may want to add to your list are The Preserve at Nottingham, Prominence Woods, Delgany, and Fieldstone. Townhomes for sale in Maple Grove MN range in price from $125,000 to around $550,000 says Maple Grove Realtor Derrick Monroe. Townhomes are typically found in neighborhoods like Fieldstone Lodges, Northglen Carriage Homes, and Gleason Farms. Another nice option is Timbers at Elm Creek. If you’re looking for a more upscale neighborhood with some custom touches, then you should add neighborhoods such as the Four Seasons at Rush Creek, Gladstone, and The Bridges at Arbor Lake to your search list. Another thing to consider is the association dues and what they cover. Some associations are much lower than others but may not cover the same things such as trash removal, water, sewer, etc., so have your agent get all the details before you run your numbers. Also, do your due-diligence when purchasing a townhome. You should ask to review the budget and balance sheets for the HOA and make sure the association has enough monies in reserves for capitol expenses. We will help walk you through this process. Townhome associations are wonderful for people looking for a bit more time at home and not wanting to worry about lawn care, snow removal and general outside maintenance. As close as Maple Grove is to the Minneapolis area, you may be inclined to think “big city” living. Even though it is the 8th largest city, this is not necessarily true. 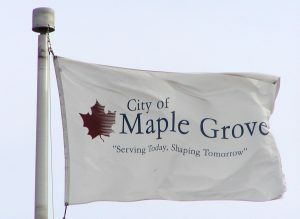 Maple Grove is home to three generous sized parks all under the management of the Three River District. Parks include Eagle Lake Regional, Elm Creek Park Reserve, and Fish Lake Regional Park. It is the perfect combination of convenience and outdoor living. There are also many homes for sale in that are next to Rice Lake and Pheasant Acres Golf Course. Maple Grove is ideal for many home buyers – about 65,000 currently, not only because of its location, community, shopping, lakes and nature, but also its choice of schools, which include 17 elementary schools and some of the best high school statistics in the area. The Derrick Monroe Group has helped many sellers and buyers in Maple Grove. We can help you. To learn more about how we can get top dollar when selling your home, give us a call today at 612-282-SOLD or fill out the form below. The Derrick Monroe Group can also show you any property for sale regardless of the listing company. Curious as to what your home in Maple Grove is worth? Fill out this form and we will get right back to you.